Storm Desmond has caused severe flooding across northern England (5-7 December 2015). Our hydrologists have provided the following background information, based on provisional data provided by the Environment Agency and the Met Office, and research carried out at the Centre for Ecology & Hydrology on floods over the last four decades. The CEH team will be investigating further and more detail will be provided in the December 2015 Hydrological Summary, due to be published on, or before, the tenth working day of January. We will also be issuing a new Hydrological Outlook for the UK later this week. More details of our flood research can be found on our Flooding science issues page. The storm has been a record breaker, with the rain gauge at Honister Pass in the Lake District recording 341.4 mm in the 24 hours up to 1800 GMT on 5 December 2015. The recently released FEH13 rainfall frequency model (Stewart et al, 2013) estimates that this observation has a return period of about 1300 years at this particular location, corresponding to a probability of 0.08% in any one year. This means that in any given year the probability of the highest rainfall being larger than 341.4mm is 0.08%. Another rainfall record was broken at a rain gauge in Thirlmere, which recorded 405 mm in 38 hours. Estimation of the return period of the storm event itself, which appears to have been characterised by widespread heavy rainfall over a long duration, will have to wait until further information is available. The FEH13 model is part of CEH’s Flood Estimation Handbook (FEH) methods which are the industry standard for estimating rainfall and river flood frequency estimation in the UK. This event comes after the region experienced record-breaking floods as recently as November 2009 when the previous largest ever 24-hour rainfall in the UK was recorded in the Lake District. Why has a serious flood happened again? The UK has experienced a number of flooding events in recent years and with Cumbria subject to significant flooding as recently as 2009. The estimated return period for the maximum 24-hour rainfall recorded at the Honister Pass raingauge for the 2009 event was 1 in 480 years, according to the FEH web service. So how is it possible that an even bigger event happened after only 6 years? When using terms such as ‘1 in 100’ or ‘100-year’ rainfall scientists are referring to the estimated probability, or odds, of a large event happening in any given year at a particular location. So this does not indicate that such an event will only happen once in a century, but that there is a 1% chance of seeing an event bigger than the ‘1 in 100’ year event every year. 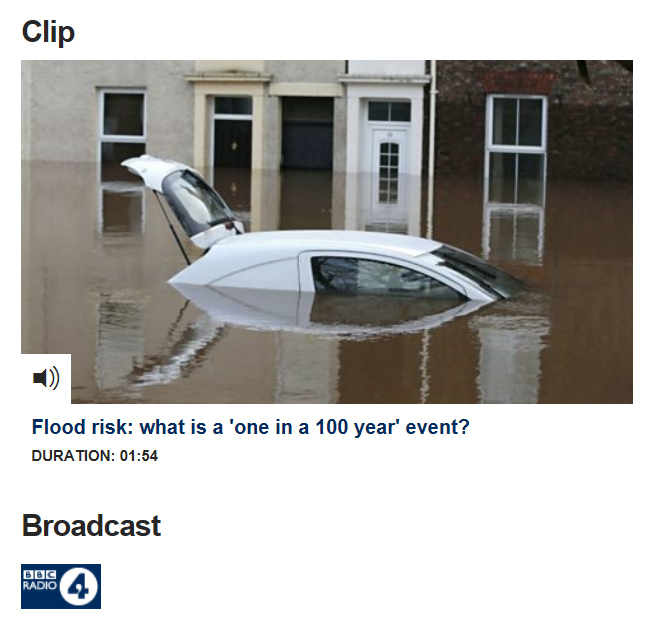 Was the flooding event due to climate change? Based on very early data, the rainfall associated with Storm Desmond led to new river level records in a number of major rivers in Cumbria. Coming after the record flows and catastrophic flooding of November 2009 and January 2005, this has inevitably prompted speculation that flooding is increasing in the region due to climate change. As may be expected, this is a very difficult question to answer. What we can say is that the events are consistent with future expectations for an increase in flooding in the UK, especially in winter. In a warming world, we expect an intensification of rainfall as, put simply; a warmer atmosphere can hold more moisture. We can also use scenario-based models to project what future changes in rainfall will mean for flooding in the UK, and in most cases these indicate increases in flood flows in the north west. This CEH research has been used to support the development of the Environment Agency guidelines on climate change and flooding (Environment Agency, 2011). But the question of whether we are seeing these effects already is a more challenging one. The UK has become significantly warmer over the last few decades and the link with anthropogenic emissions is unequivocal. But has this affected flooding? One way to investigate this is to look at long records of rainfall and river flow. There is mounting evidence (Met Office, CEH 2014) for an increase in heavy rainfall in the UK over the last 40 years or so, but increases in rainfall do not necessarily equate to equivalent increases in flooding. A great deal of research has used the data held on the National River Flow Archive to assess whether there are long-term trends in flooding in the UK. This work is reviewed and published by CEH scientists (Hannaford 2015 and LWEC climate change report card), while an analysis of the flow and rainfall maxima was also published by CEH (Prosdocimi et al, 2014). In general, the work concludes that there is little compelling evidence for any upward trend in long records of flood magnitude or frequency in the UK. However, the north and the west of the UK has seen an increase in high river flows since the early 1960s that has been associated with changes in atmospheric circulation patterns, in particular, the North Atlantic Oscillation which in its positive state, as is it now, results in milder, wetter winters in the north-west. The flooding has also occurred against the backdrop of a strong El Niño, which in early winter is generally thought to increase the likelihood of a positive NAO, but the link is complicated by lots of other factors. However, it is not clear to what extent the recent cluster of floods in the north-west is associated with climate change, natural variability or a combination of both. Much of the research in the UK using very long records points to pronounced variability between decades, leading to ‘flood rich’ and ‘flood poor’ periods driven by the NAO and other factors. We simply don’t yet know whether the clustering of recent floods is due to anthropogenic warming or a result of such variability. It is, therefore, hard to attribute any event or cluster of events to anthropogenic climate change using observational records alone. "We simply don’t yet know whether the clustering of recent floods is due to anthropogenic warming or a result of such variability. It is, therefore, hard to attribute any event or cluster of events to anthropogenic climate change using observational records alone." When it comes to the question of attribution, even long records are not informative; if we are seeing emerging effects of climate change, we would expect these effects to be more apparent in the last few decades. We need to use sophisticated modelling techniques in order to undertake attribution studies. Following the widespread flooding in 2000 we and our partners published some research papers that showed these events were more likely to have occurred because of man’s influence on the climate (Pall et al, 2011; Kay et al, 2011). We are just about to publish the results of a similar study for the Winter 2013/14 floods to supplement the review of the atmospheric and hydrological drivers that led to this flooding (Huntingford et al, 2014). Similar studies will also be undertaken for the events of December 2015 when the data become available. Our COSMOS-UK Soil Moisture Network also has readings from the affected areas. Kay, A L, Crooks, S M, Pall, P and Stone, D (2011). Attribution of Autumn/Winter 2000 flood risk in England to anthropogenic climate change: A catchment-based study. Journal of Hydrology, 406, 97–112, doi:10.1016/j.jhydrol.2011.06.006. Huntingford, C, Marsh, T, Scaife, A A, Kendon, E J, Hannaford, J, Kay, A L, Lockwood, M, Prudhomme, C, Reynard, N S, Parry, S, Lowe, J A, Screen, J A, Ward, H C, Roberts, M, Stott, P A, Bell, V A, Bailey, M, Jenkins, A, Legg T, Otto, F E L, Massey, N, Schaller, N, Slingo J and Allen, M R (2014). Potential influences in the United Kingdom’s floods of winter 2013-14. Nature Climate Change, 4(9), 769–777, doi:10.1038/NCLIMATE2314. Pall P, Aina T, Stone D A, Stott P A, Nozawa T, Hilberts A G J, Lohmann, D, Allen M R (2011) Anthropogenic greenhouse gas contribution to flood risk in England and Wales in autumn 2000. Nature 470:382–385. Prosdocimi, I, Kjeldsen, T R, and Svensson, C: Non-stationarity in annual and seasonal series of peak flow and precipitation in the UK, Nat. Hazards Earth Syst. Sci., 14, 1125-1144, doi:10.5194/nhess-14-1125-2014, 2014.